The purpose of this workshop is to provide practical tips for parents and simple messages on the topic of parent-child attachment. The workshop is designed for a group of 8-12 parents of children aged 0 to 1, and their babies, and lasts 60-75 min. It is important to comfort your baby when he needs it, especially when he is hurt, sick or frightened. It is important to talk, read, play and have fun with your baby every day. 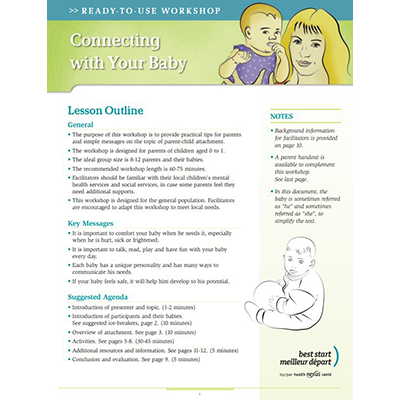 Each baby has a unique personality and has many ways to communicate his needs. If your baby feels safe, it will help him develop to his potential. Introduction of presenter and topic. Introduction of participants and their babies.